In this quick tip, I talk about how to quickly center stuff horizontally and vertically using the ‘Align’ panel, something sometimes overlooked in After Effects. Rather than manually adjusting the layers and using the title safe, simply click two buttons and your layer should be perfectly centered. Remember, this works with virtually all layers of After Effects (not audio layers of course) and does not apply to just text. So the next time you try to center stuff, use the ‘Align’ panel. I suggest adding it to your custom workspace for easy access. Of course if you have any other questions, feel free to leave them down below as I love doing these quick tip videos! Many thanks for your support guys! Nice! I’ve been wondering if this was possible and it’s just like Photoshop! Thanks a lot VinhSon! 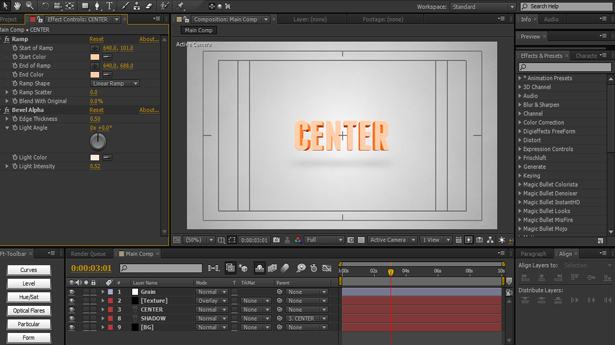 Hey Mark, I’m pretty sure it does set keyframes because when you center it up, it changes the position parameter. Try it out 🙂 And no, the text is completely made in AE. I may do a tutorial on creating some nice looking text in AE soon! Thanks for your feedback comment! Hey men, how do yo do the 3d text???? It’s simply just a bunch of stacked up 2D text layers to give it the illusion of 3D text. Glad you learned something, and thanks for your feedback! A basic black solid, masked and feathered, then linked to the text. Thanks! Very helpful. Could’ve been a 45 second video, though, rather than 3 minutes. What happens if I want to center a “group” of elements evenly distributed. From the Align panel I can “horizontal center distribute layers”, but then if I try to center the whole distribution, every element would go to the middle one above the other. That’s one of the flaws of using the Align panel. I’m still searching for a solution for this. How do you do this for a specific vertical area? For example, with a text inside a lower thirds black bar? There’s not a simple way to do this as AE only focuses on the main cardinal directions.